Annual Bike to the Sea Day Ride Set For Sunday, June 1 – Bike to the Sea, Inc.
About 50 cyclists participated in the Bike to the Sea Day ride last year, taking a break along the route in Saugus. The 22d annual Bike to the Sea Day ride is scheduled for Sunday, June 1 at 9 a.m. Registration is available online or participants can register the day of the ride starting at 8:30 a.m. The ride starts at the Madeline English School, 105 Woodville St. in Everett. 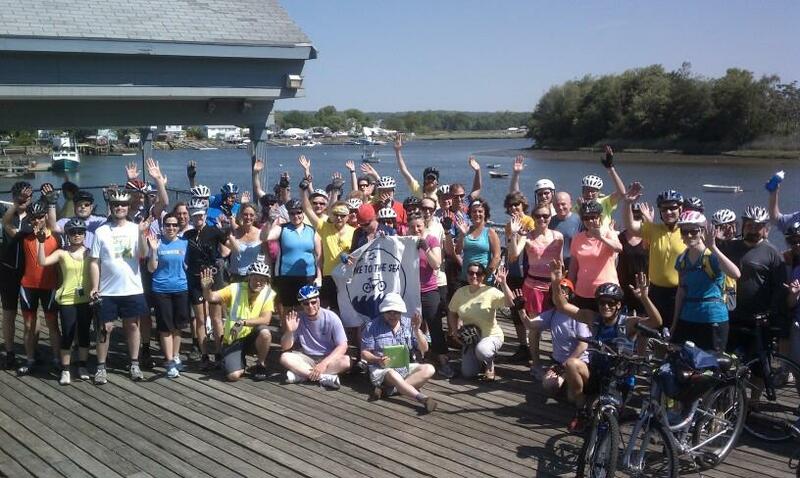 There is a 14-mile family ride to the Saugus River and back and a 20-mile ride to Nahant Beach and back. Both rides end at the Dockside Restaurant on Centre Street in Malden and include lunch. The routes include traveling on newly paved sections of the trail in Everett and Malden but also include some on-street bike riding. Police escorts control traffic at major intersections. Some of the trail is unpaved so wider tires are recommended. Individuals: $15 ($20 day of the ride), includes lunch and a T-shirt. Families: $25 ($30 day of the ride), includes lunch for four and two T-shirts. Additional Family Members: $10, includes T-shirts. A $50 optional donation to Bike to the Sea includes a commemorative bicycle bell. And optional $5 donations to the MassBike Coalition are encouraged. Checks should be made payable to Bike to the Sea Inc. and can also be sent by mail to 57 Hammersmith Drive, Saugus, Mass. 01906.